Lately, Colorado anti-fracking activists have spent a huge chunk of their time protesting at the “wrong door” of a county commissioner’s home, staging poorly timed “die-in” protests, shutting down an energy company’s community meeting and even crashing the Colorado Governor’s book signing. Some might call these stunts acts of shameless attention seeking, as these “Keep It in the Ground” groups have really upped the ante lately. But one thing is very clear here — anti-fracking activists are spending a lot of time in wardrobe and not enough time digging deep into the lines of their scripts. In other words, “Keep It in the Ground” groups might want to allocate some time for serious research and fact checking before the next protest poster decorating party (and yes that’s a real thing). It was no surprise to see D.C.-based national anti-fracking group Food & Water Watch (F&WW) at this past Monday’s Colorado Oil and Gas Conservation Commission (COGCC) meeting held in Denver. In fact, the most outrageous performance was given by F&WW’s operative. The F&WW operative clearly directed the show on Monday, passing around medical masks and instructing other activists to decorate their masks with anti-fracking rhetoric meant to symbolize the “toxic” air in Colorado caused by what one reporter called “oil fracking,” whatever that is. But as ridiculous as those antics were, they were trumped by the activists’ use of several debunked studies and misrepresentation of another report. Here’s a rundown. The activists referenced the American Lung Association’s (ALA) annual air quality reports, which have long been debunked not only by Energy In Depth, but by state air regulators, EPA officials and the local news media. In a 2015 follow-up interview with Energy In Depth, CDPHE Air Pollution Control Division Director Will Allison revealed that the ALA report card ignored a full year of air quality data from 2014, which shows ozone levels getting better, not worse. For the (at the time) ALA of Colorado vice president Cindy Liverance to claim there’s higher ozone now than back in the 1970s also ignores decades of air quality data that show “it’s gotten a lot better,” Allison said. This clap back at ALA isn’t unique to Colorado. Widespread criticism of the ALA reports has poured in from across the country in recent years from the Pittsburgh Post-Gazette’s editorial board, as well as government agencies and regulators like EPA Region 7, the Indiana Department of Environmental Management, Maryland Department of the Environment, Texas Commission on Environmental Quality and Hamilton County Department of Environmental Services. Consensus shows that ALA is misleading the public by misrepresenting information in an effort to advance its agenda. Nevertheless, anti-fracking activists continue to rely on these reports, despite the fact that ALA’s data is faulty and inaccurately aggregated. Fracktivists exploit conveniently timed NCAR report – but what did that report actually say? On the morning of the COGCC meeting, the Boulder Daily Camera reported just 35 minutes before the meeting started that a “new air quality report” had been released that same day by Boulder’s National Center for Atmospheric Research (NCAR). Coincidentally, news of the “new report” came out around the same time that nearly 60 anti-fracking elected officials and activists were lining up at the doors and signing up to give public comment for the 9 a.m. COGCC meeting. Interestingly enough, when NCAR first began their experiment back in 2013, the Denver Post reported that “Anti-drilling groups are making health fears the focus of campaigns against drilling near communities,” and that’s basically what happened on Monday at the COGCC meeting when nearly 60 anti-fracking activists used studies like the NCAR report as scientific “facts” to support their anti-fracking mantra. 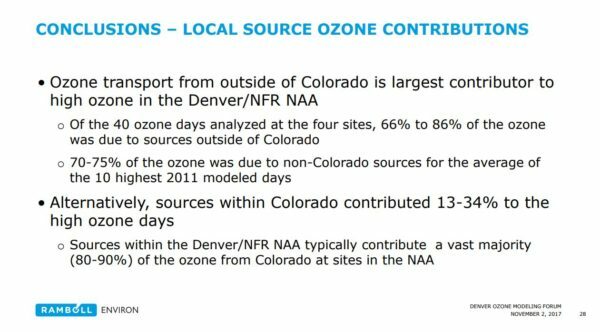 Flocke’s hunch regarding on-road mobile emissions was a key piece in the ozone production puzzle discussed during a Regional Air Quality Council (RAQC) 2017 Ozone Modeling Forum held yesterday in Denver. Ralph Morris from Ramboll Environ presented on Local Source 2017 Ozone Source Apportionment Modeling. Morris gave an example from Chatfield, Colo., that proves on-road mobile emissions is the largest local contributor to ozone production on the Front Range. 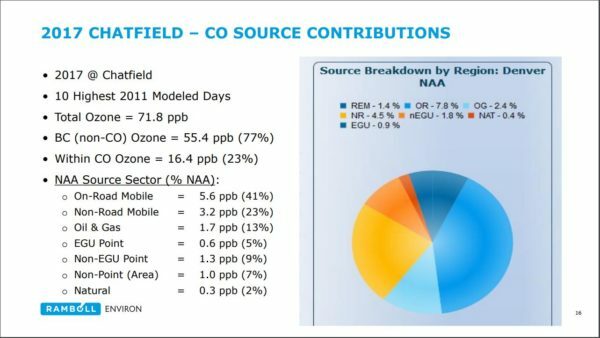 In the Chatfield sample, on-road mobile emissions represented 41 percent of local source contributor to ozone production on the Front Range. Morris’ conclusion indicates that despite the fact that on-road mobile emissions is the largest local source contributor to ozone formation on the Front Range, data shows that background ozone, or ozone transport from outside of Colorado, remains the top contributor to ozone production on the Front Range, far exceeding that of on-road mobile local emissions. NCAR wasn’t the only report that just so happened to come out right before the COGCC’s meeting. Many anti-fracking activists cited the exact words from a “study” released last week that produced headlines such as “fracking chemicals and kids’ brains don’t mix” in fringe “Keep It in the Ground” friendly news outlets. One activist stated in public comments that, “It doesn’t take a PhD to figure out that fracking chemicals and kids’ brains don’t mix.” Last week, Energy in Depth-Health debunked this study, noting it was authored by anti-fracking researchers and published in an activist-led journal. And not only did the “study” fail to prove causation, it was also a “literature review” of similar activist-driven studies that also failed to establish causation and verify their topline conclusions. In addition to more recent anti-fracking commissioned studies and reports referenced by activists, many protesters also called on old research, which has been debunked and well documented as absolutely false by Energy In Depth. Most notably, several activists referenced Lisa McKenzie’s recent paper linking oil and gas development to childhood leukemia, conveniently ignoring the fact that the paper was disavowed by CDPHE. In contrast, CDPHE’s landmark health assessment that found that “the risk of harmful health effects is low for residents living [near] oil and gas operations,” and that “results from exposure and health effect studies do not indicate the need for immediate public health action” wasn’t cited once by activists. 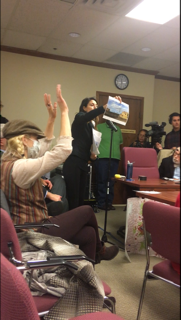 The COGCC public meeting further confirms that fracking opponents should spend a little more time on studying the facts than finding the right costumes for their theatrical stunts. But despite concerted efforts of anti-fracking researchers working to institute fear through “science,” the facts remain and with that, all scientific credibility is lost for the “McKenzies” of the world.